tarte is one of my favourite make-up brands. I love their views on incorporating natural ingredients and their stance on animal testing. Not to mention their products are amazing, and design is gorgeous! I have slowly been adding more of their line into my collection. However about a month ago, I dived right in by ordering this 6-piece set, Journey to Natural Beauty, from QVC. I'm sure the newest addition to the tarte mascara line, lights, camera, flashes! will be a hit. The gold snake-embossed tube is so glamorous. The differing lengths on the rubber wand are very intriguing. I am keeping it tightly sealed though as I have a couple of more mascaras I need to finish! Including it's predecessor, lights, camera, lashes & tarte's gifted mascara. 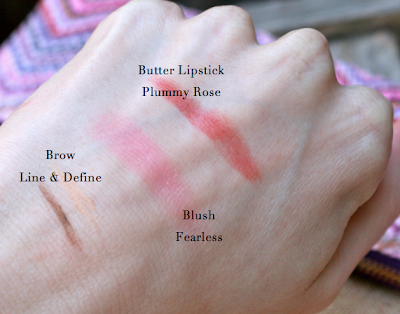 Butter lipsticks are a new addition to the tarte line, and the shade plummy rose is the perfect everyday colour. It smells of mint. Mmm! I have been on the market for a brow product. I have never been one to fill in my brows, always considering it be kind of unnecessary as mine are on the fuller side. They are so important to framing your face, so I had been thinking of giving it a go and adding brows to my daily make-up steps. However, I had no idea which product(s) to try or what colour to go for. I feel like the brow architect is just what I was looking for! It has three different tools in one simple pencil form. Plus the shade is universal so minimal worries about colour selection. And to store all of your new products is a cute foldover style make-up bag with gold flecked woven fabric on one side and raffia pink & purple chevron on the over. The hardware is in gold and the internal fabric is royal purple satin. If left unfolded it's a huge size! I like the aesthetic when it's folded over. And that's the tarte Journey to Natural Beauty 6-piece collection! It's exclusively available on QVC. It's definitely an amazing value, even when not picked up at the 'Today's Special Value' price. I know each of these products will become staples for me. Definitely spring classics! 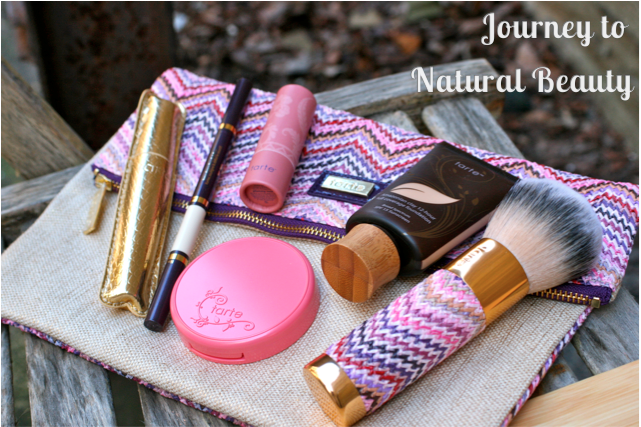 Did you order the tarte Journey to Natural Beauty set? Do you like buying sets or do you prefer buying individual products at a time? Thanks!! I have been loving the foundation!